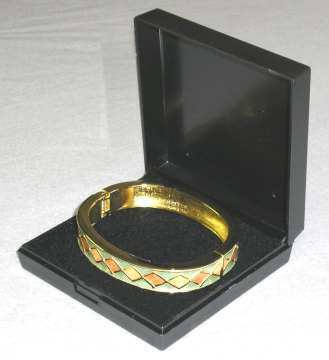 Bangle or Bracelet hard plastic gift box. Black colour bangle box approx. 82mm x 82mm x 24mm high. Excellent quality hinged plastic presentation gift display boxes for bangles, bracelets or similar sized jewellery items. Plastic Bangle boxes include foam display black padded insert. (Jewellery stock not included, image as example only).